I've always admire woman that can pull off the white on white trend, especially woman like Ivania of Love Aesthetic. She's someone that take a all white minimal look and make it look crisp, fresh, and interesting. I've never felt like I was the girl that can wear an all white look, I'm usually to clumsy to wear white. I put my fears of spillage aside and put together a summer white look that I'd feel comfortable in. The trick I figured out is to mix in cremes with whites, for me the thought of a creme and ivory seems more interesting than a starchy white outfit. Also somehow, the off-white colors make it less intimating. 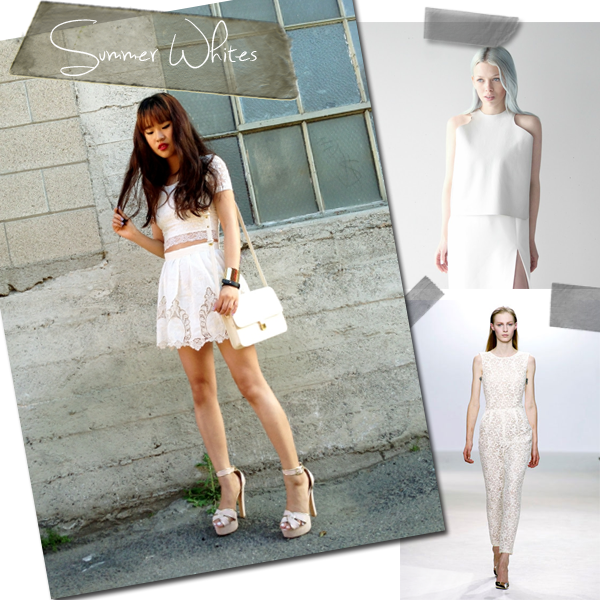 If your worried about seeming to dull in an all white look pick pieces that have details like, lace or beading. What do you think of the all white summer look? I love the all-white look but I to am always afraid of spilling on myself! I've wanted to get a pair of white jeans but then I get scared that I'll sit on chocolate or something, lol. I love your sparkly skirt and I think playing with whites and off-whites is a good way to ease into it! Fun inspo! Loving that skirt! i'm totally loving the all white trend this season! so pure and chic!